Epilepsy is among the five most common neurological disorders prevalent globally. The World Health Organization estimates that at least 50 million people are living with epilepsy. It is a condition characterized by uncontrolled seizures, that may repeat themselves for no apparent reason. Epilepsy is a neurological disorder, which affects the central nervous system. In other words, it is a disorder of the brain’s electrical system. A seizure is like a electrical storm in the brain. During this abnormal electrical storm, the involved part of the brain cannot perform the normal task. People experience sudden alteration in movements, sensation, awareness or behavior. The outward effect can be as dramatic as a wild thrashing movement or as mild as a brief loss of awareness. Even though it is a common disorder and so much research going into the subject, very little is known about Epilepsy. Causes of epilepsy are still not fully understood. There is a weak relationship with genetics, socio-economic status, environmental factors and brain trauma. However, in the majority of cases the cause of the condition is unrecognized. It is estimated that about 70% of those living with epilepsy can live close to normal life with the help of medications. However, 30% have to suffer and cannot live a fulfilled life. Further, there are lots of social stigmas attached to the disease. It means that people living with epilepsy may experience social isolation. Medical professionals recommend exercise as a complementary treatment for epilepsy, as they recognize the fact that exercise improves fitness, energy, mood and relieves stress. Improving the overall health and well being in this way can help reduce seizures and the impact of epilepsy for some people. It can also help people to feel more in control of their health. The practice of yoga has been proven for its lasting health benefits. Yoga is not just about some physical movements; asanas (yoga postures) and yogic breathing exercises have great impact on the functioning of the nervous system. Controlled breathing, meditation and gentle yoga postures aid to reduce stress , a well-recognized triggers of seizures. A well-balanced Hatha Yoga or a Yin Yoga practice can calm down the nervous system, which can reduce the chances of going into a seizure or stop the seizure before it becomes full blown. Interestingly, if yoga postures, breathing exercises and meditation are practiced regularly and long enough, they may lead to some permanent changes in the brain. Therefore yoga could have a very positive effect, as an additional treatment along with medication. And there is a chance that after prolonged practice positive changes in the body and brain will occur. These changes may help prevent seizures, increase the duration of seizure-free periods. Seizures can happen at any time and for no apparent reason. 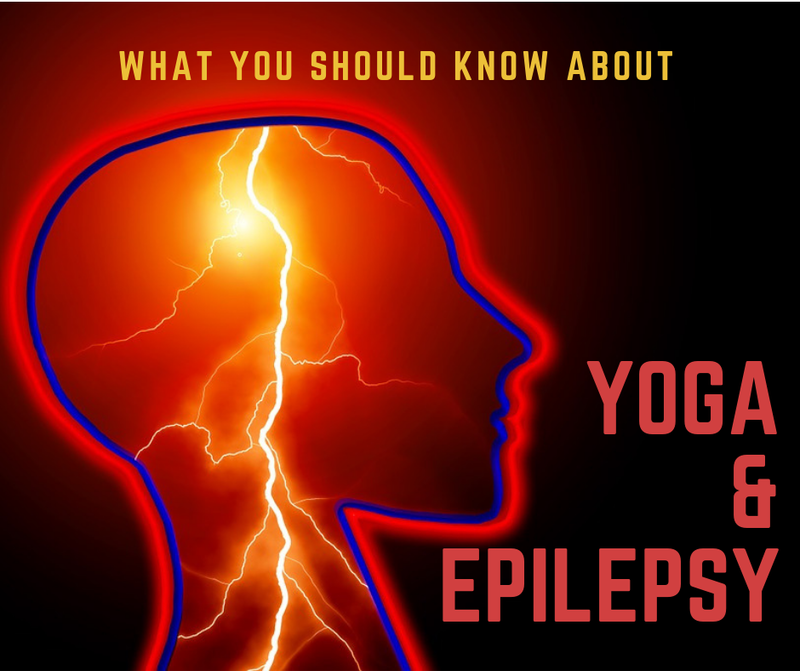 Therefore as a yoga teacher you should be informed if a student suffers from epilepsy. Most people will share this kind of information with you, however to be on the safe side, consider having all new students fill in a basic admission form. In this form, you ask for any injuries, conditions and other problems that might influence their yoga practice. It is also recommended to state clearly, that students assume full liability for their own health and well-being. If a student informs you about their epilepsy, make sure to inform yourself clearly about how the disease manifests for the student and what you should do if your student has a seizure during class. Triggers for seizure vary greatly. They can be related to stress of a new environment, sensory stimulation like bright lights, low blood sugar right before lunch time, not enough sleep the night before, or the menstrual cycle. There are no indications that certain postures or cardiovascular exercises trigger seizures. Most epilepsy patients are aware of certain triggers that cause seizures. So ask your student if there is a likelihood that some triggers might occur during the class, what these might be and how you can help to avoid them. Treating your students that suffer from epilepsy with great delicacy and not permitting them to actively engage in the class is not necessary. It’s important to remember that it is very unlikely that certain exercises and physical strain cause a seizure. The exercise component of yoga is therefore very helpful and is only very rarely a trigger for seizures. To remain on the safe side, make sure that the student does not over exert him or herself. Generally speaking, students with epilepsy can do all breathing exercises, sun salutations and most yoga postures. The biggest risk for yoga students with epilepsy is falling out of a pose when having an unexpected seizure. Therefore, as a teacher you should give variations of postures that could cause injury if they fell out of them or stay with the student for the entire hold of the pose. Postures that would pose such a risk are the Headstand and the Shoulderstand for example. Keeping all the above mentioned cautions in mind, if a student feels motivated to practice challenging asanas such as inversions and hand balances and has a good early recognition of impeding seizures – consider to encourage them to try with you standing close by. At the same time, of course, caution them to stay aware of what they are doing, how they are feeling and request them to stop immediately if they feel something isn’t right (as they are already doing in any other situation). The following 8 exercises and yoga postures are beneficial to calm down the nervous system and are therefore helpful in dealing with the after-math of a seizure. As mentioned above, with regular practice some epilepsy patients might even experience a reduction of seizures. Initially we recommend to practice this breathing exercise without retention. So, breathing in 4 counts through the left nostril and then breathing out immediately 8 counts through the right nostril. To complete one round, breathe in again through the right nostril for 4 counts and breathe out through the left nostril 8 counts. Once this feels comfortable, you can add a 8 count retention after the inhalation (and before the exhalation). While resting the forehead on the mat and letting your breath become easy and comfortable, you enter the rest-and-regenerate state of your nervous system. The gentle pressure of the forehead against the ground is very calming and soothing. Make sure that your forehead is resting on the mat or a bolster and that also your buttocks are either resting on your heels or on cushion. The slightly increased blood flow toward the head and the pressure in the throat region, triggers a physical reflex referred to as the baroreflex. It is one of the many triggers we have in our body, that make us enter the calm and relaxed state of the parasympathetic nervous system. Because of this effect, the Shoulderstand is actually a very relaxing pose. In order to make this pose more accessible and safer, we suggest to teach it with the feet up against the wall for students with epilepsy. The Seated Forward Bend (Passchimottanasana) is an excellent pose to stretch the entire back side of your body and release tension in your lower back and hips. Before entering the pose, make sure that you are sitting high up on your sitting bones. Enter the pose with a straight back and as you reach your maximum flexion, allow your upper back to round and your forehead to rest on your knees (or on a support). If your hamstrings are tight, bend your knees and rest them on a folded blanket before entering the pose as described above. Once you are in the pose, try to relax completely while breathing into your lower belly and lower back. The Sleeping Pigeon Pose lengthens and releases tension deep inside your buttocks (the glutes and piriformis) and the hip flexors (quadriceps femoris and psoas) whilst giving space to breathe into the body and check in with how you’re feeling. The psoas is considered to be a storehouse for stress and anxiety and gently stretching it can help students with epilepsy release long-stored emotions and stress. The Seal is an adapted version of the Extended Cobra Pose. Through using cushions under the belly, it becomes a Yin Yoga pose that can be held for 3 – 5 minutes. It is an excellent pose to massage the sacral-lumbar arch and it stimulates the whole spine and abdominal organs. The Garland Pose, aka Yogic Squat, is a pose in which you have to find a balance between activation and relaxation. While you are pushing heels into the ground, pushing your elbows out, and reaching up with the top of the head, allow your Achilles heels to relax, and your inner thighs and calves to lengthen. Make sure to keep that your heels are resting, and if necessary support them on a folded mat or a block. The Tree Pose is an immensely grounding and calming pose, in which you can develop one-pointed focus and a clear mind. Look at a point slightly above eye level and approximately 2 meters away. Look at the point with a gentle gaze and if you are struggling to maintain your balance, direct your breath to the focal point. Hold the pose for at least 1 minute each side.